Inder Loves Folk Art: Swirly Snails. I'm trying something new with my sewing: I sketched (okay, scribbled) some loose sewing plans in one of my sketchbooks. It's like a visual version of Nicole's "rota" and includes plans for everyone in my family (including Steve!) plus a couple of gifts. And then I have gone through each of the items (in no particular order) and knocked out my projects in a somewhat organized methodical fashion! Who am I? Yeah, we'll see how long this lasts, right? So far it has been fun. Every fabric store should have a basket of toys somewhere, amiright? There is a reason that Stonemountain and A Verb for Keeping Warm are my favorite local fabric stores: TOYS. I am a fan of local independently owned fabric stores for all of the usual reasons as well, but the toys are a huge factor! I can actually say to my kids, "let's go to the fabric store!" and they are cooperative, even eager! They want to know if it's the store with the kid-sized shopping cart (Stonemountain) or the one with the basket of legos and train set pieces (AVFKW). And over the years, their interest in the fabric store has expanded from the toys and potential to wreck havoc in the thread and zipper sections to the actual fabric. Every once in a while, I allow them to each pick out a fabric for a new piece of clothing. This requires some diplomatic steering by me ("No, I am not going to sew with bubble gum pink cupcake-printed quilting cotton"), especially with Maggie. Joe, with his budding sewing knowledge, is learning that some fabrics are "t-shirt fabrics" and other fabrics are "button-down shirt fabrics." Maggie still only cares about "PINK!" On the way home from the fabric store last week, Joe announced, "When Maggie gets older, you will teach her to sew, like me, right? I already know how to sew, because I watch you sew every day!" 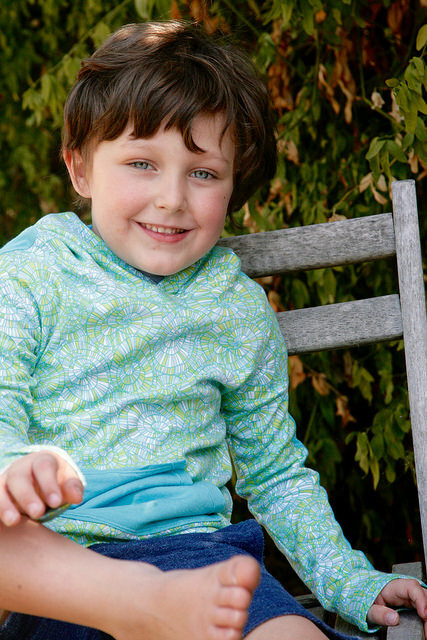 "Maggie," he explained, "you have to go slowly and make sure your fingers don't get pinched." On this most recent outing, I steered the kids to the cotton lycra knits and asked them to pick something from that section. Maggie chose something predictably pepto pink, which I will be sharing with you in my next blog post. But Joe really surprised and delighted me by choosing this really beautiful Valori Wells print. It is not something I would have picked for Joe, probably writing it off as too feminine, but Joe has such a good eye! Not only is the print fantastic and boy-appropriate, but the print reminds Joe of "swirly snails" which is obviously a win! Also, hello, is that Joe's color or what? When Joe put on his new Rowan Tee hoodie, I commented "Joe, that color makes your eyes pop right out of your head!" To which Joe responded, "Eyes popping out of my head?! Ewwwww. That would be gross!" He may also have commented that the kangaroo pocket "looks like there is a pair of undies stuck to the shirt." Um. Okay, now that you mention it ... I am going to think about undies every time I see that pocket! He's wearing it, and that's what counts, right? Now I want to sew all the light blue things for Joe. 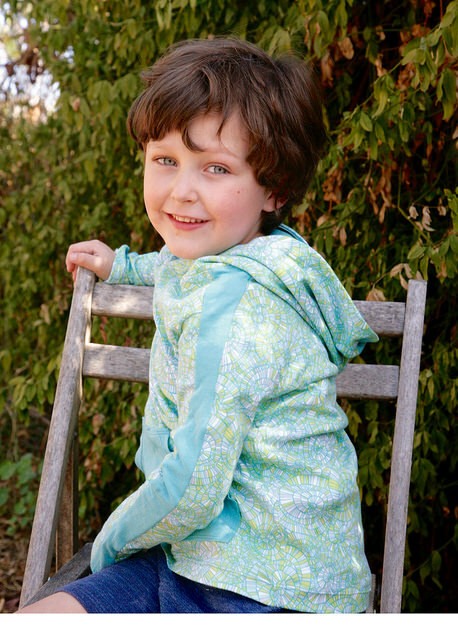 Lucky for me, his favorite colors are blue and green, and he loves interesting (some might say busy) prints. While Joe is extremely picky about comfort (ahem, we are dealing with some sensory issues in my house), I do love his taste in fabrics and when we can agree on a project, he is really fun to sew for. Anyway, pattern deets! I've been a Titchy Threads fan for a long time, but this was my first time sewing the Rowan Tee. Laura kindly gifted me the pattern a while back as a thank you for testing the Safari Raglan pattern. There's no real reason I hadn't sewn it yet except that I have several TNT t-shirt patterns for Joe and didn't feel like printing out and tracing a new pattern. But with the autumn coming, I was inspired to sew a sweatshirt-styled tee for Joe. This knit has a nice weight to it that lends itself to a warm layer, and I love all of the options this pattern provides. I decided to make the hooded version with arm stripe and kangaroo pocket, using a light blue jersey for the contrast and lining. It may technically be autumn, but has not started to cool off much in Oakland. Joe was a good sport and came outside to let me photograph him even though this sweatshirt was really too warm to be wearing on a warm October day. Titchy patterns are great and walk you through every detail of construction. I love that she gives you the option of printing in only one size (layered sizes) and that she tells you which pages to print for which option, so that you can save paper if you plan to make only one option. Her instructions are also super thorough. Now, at this stage in my sewing career, I don't always appreciate "thoroughness" in instructions the way a newbie might, because there is more detail than I need and it is hard to scroll through super long instructions to find the information I do need. But, never fear! Laura has a "cheat sheet" at the end for more experienced sewists or for repeat sews. The only part of this pattern where I really needed the instructions was the arm stripe (which goes in after you sew the sleeves to the body!) and attaching the hood to the neckline. For those sections I did go to the more detailed step-by-step instructions and found the illustrations to be great. 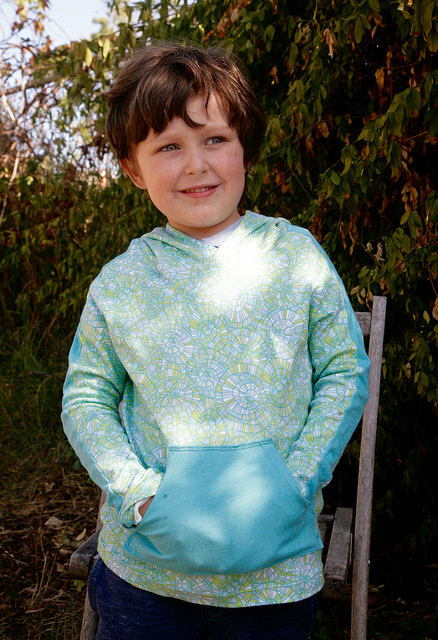 Titchy Patterns are everything you have come to want and expect in an indie pattern - great fit, clear and thorough instructions, lots of photographs, and lots of options. And as I've said before, Laura's drafting is especially precise and her finishing is very clean. The sleeves are cut very narrow, and the Valori Wells knit is not very stretchy, so this is definitely a hooded tee, rather than a sweatshirt that can easily accommodate under layers. Most likely Joe will wear this over a short sleeved shirt. The stripes are not overlaid but rather pieced into the shoulder. I was (and am) a little concerned about how many seams this tee has, and whether my super-sensitive Joe will decide that they are annoying. 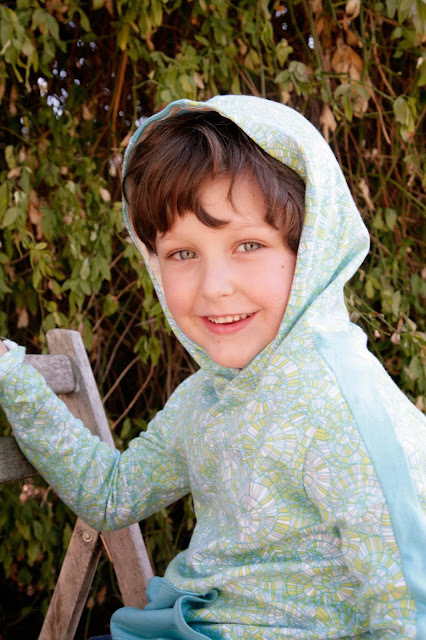 Similarly, the hood is simply sewn to the neckline and then the seam allowance is pressed down. Topstitching in the seam allowance is given as an option. I serged this seam and topstitched the seam allowance down, but I am worried that the serged seam around the neck might bug Joe. So far he hasn't complained, but I know this kid. He's like the Princess and the Pea when it comes to clothing. I am considering going back and sewing a thin strip of jersey over that seam to protect his sensitive skin from the serged and topstitched seam allowance, which is a little thick and scratchy. I will say this, allowing my kids to pick fabric for a project seems to be helping them to feel more excited about the things that I make them. I am also getting better about knowing what Joe will or will not tolerate as far as garments. I know Joe loves the looks of this sweatshirt, he was so excited when I finished it! So now we just have to see if it meets his standards for comfort. I get the feeling that learning to sew for kids with "sensory issues" is going to be part of my life for a long time. Joe has already picked the fabric for his next project, a deliciously soft blue tweedy cotton flannel for a "soft button down shirt." We are currently arguing over whether it should have brown buttons (me) or blue buttons (him). But you'll have to wait your turn, Kiddo! I'm on a rota! Bwa ha ha- undies stuck to his shirt! This kid is hilarious! You're so right, this fabric does make his eyes pop- wow! Undies! That is brilliant. I bet someone could market a top to boys simply by saying it has an 'undies pocket'... And yes, those colours do look absolutely gorgeous on Joe. Nice fabric pick on his part! This make caught my eye on Flickr (I feel like I am over there by myself these days though!) and I have been waiting to see it. It is awesome! Joe has a good eye for fabric (and beautiful actual eyes in his head) - I also would have written it off as girly but it really isn't, especially with the stripe accent. His sewing tips are also very astute ... it took me awhile to realize the value in going slow! Good fabric choice Joe! Hope it's comfortable enough to wear as it's certainly a great looking sweatshirt that suits him! Thanks Noelle! I think I am going to do a strip of fabric over the seam at the neck so that he'll be more comfortable wearing without a shirt underneath, but so far so good! Joe looks so totally gorgeous in this. I reckon the jersey over the seam at the neckline may be a good precautionary measure. That and loads of compliments! That's beautiful. I like the material Joe picked and underwear stuck on the front;) Do you know of a good pattern for a hoodie for adult men? It's one of the reasons I'm learning to sew, because I can't find a good hoodie anymore. They skimp on the fabric on the hood and the hoods all want to slip off the back of my (I swear I never thought it was all that) big head! lol! It would be nice to be able to make the thing that I want and that it seems I can't buy anymore. Hi Patrick! Sorry it took me a while to get back to you. Have you looked at Thread Theory patterns for men? 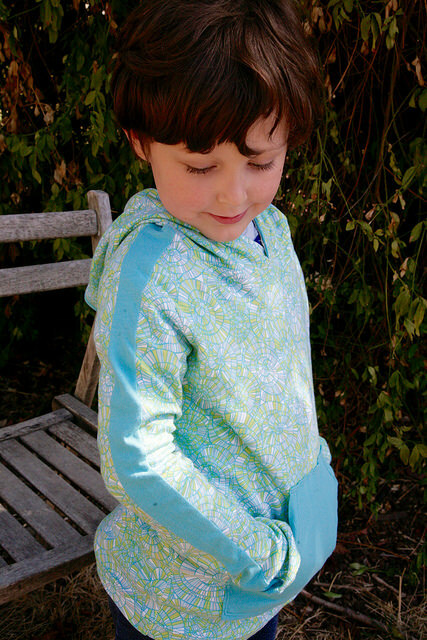 There is a hoodie much like this one - a variation on the Finlayson Sweater. http://threadtheory.ca/collections/mens/products/finlayson-sweater I am actually making the Strathcona t-shirt for Steve and I like the narrow fit on him. Yep Joe, your eyes are popping out of your head and you've got undies on the from of your hoodie, but you know what? You still look really pretty, and cool and handsome. He sure is a beautiful child and, yes, that fabric is most definitely in his colour! This is a great showcasing of what looks like a lovely pattern. This would be such a useful pattern for our climate, but sadly my R would rather cut off his arms than wear long sleeves. I am truly looking forward to seeing what you'll make for your husband. I have sewn precisely NOTHING for my husband, so I'm in need of some inspiration! Oh yes, Rowan is much like Joe in this respect, except the limbs vary - Joe will not wear pants. Only shorts. These funny boys! I love this! Especially the color of the contrasting color next to the print along the arms. You'll have to report back if you add a strip of fabric to the neckline. I've noticed this is how most store-bought shirts are finished along the back neck but I've never seen it in sewing instructions. What a fun shirt! I need to move this pattern up on my to-sew list. Maybe KCW. Any thoughts on the sizing compared to a Flashback skinny tee?